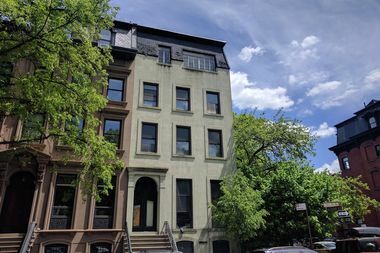 A Brooklyn man is accused of illegally seizing ownership of this home on Fort Greene Park, one of six Central Brooklyn properties he controlled through the use of fraudulent deeds, the Brooklyn District Attorney said. BROOKLYN — A Crown Heights man has been indicted for trying to steal six homes in Central Brooklyn using fake deeds — and imposters to pretend to be their owners, prosecutors say. Aderibigbe Ogundiran, 36, is accused of targeting properties that appeared abandoned or whose owners had died, illegally scooping up deeds in Fort Greene, Bedford-Stuyvesant, Crown Heights and East New York according to the Brooklyn District Attorney’s office. The investigation of Ogundiran began in 2015 when the occupant of 176 Washington Park — a five-story 19th Century mansion located directly across from Fort Greene Park — received a notice to vacate the home that had belonged to her brother, who died in 2011. Prosecutors said Ogundiran took control of the home using an imposter who posed as the deceased man to create a deed. He then transferred ownership of the mansion to a corporation he controlled, prosecutors say. Ogundiran repeated that process at five other Brooklyn properties, sometimes filing fake documentation granting him or his corporations power of attorney at a home. Using those methods, Ogundiran took control of three properties in Bedford-Stuyvesant including a three-story building at 1424 Fulton St. and two small houses at 42 and 49 Albany Ave; a three-story brownstone in Crown Heights at 123 Albany Ave.; and a two-story brick house at 1024 Hendrix St. in East New York. “We vow to continue to vigilantly prosecute scam artists such as this defendant, but at the same time I would urge homeowners to protect themselves by registering with the Automated City Register Information System (ACRIS) so that they are automatically informed of changes made to documents associated with their property,” he said in a statement. Ogundiran was arraigned Tuesday on 64 counts including forgery, scheme to defraud, identity theft, grand larceny and criminal impersonation, prosecutors said. He is being held on $200,000 bond or $100,000 bail and is set to return to court June 7. He faces up to 25 years in prison if convicted. His attorney Frederick Spiegel was not immediately available for comment on the charges on Tuesday.